I asked for advice on my Facebook page last week about what to get Kate’s daycare teachers for Christmas, and got all sorts of fabulous ideas! 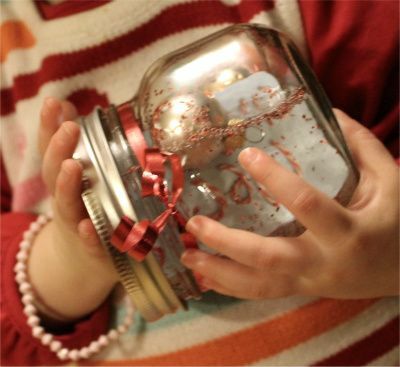 My favorite suggestion came from my friend Allison who posted an idea (compliments of The Creative Mama) for giving a gift card inside a DIY snow globe. I know that gift cards are a favorite thing to receive, but simply handing one over has always seemed so impersonal (and boring) to me. This idea was the perfect solution! 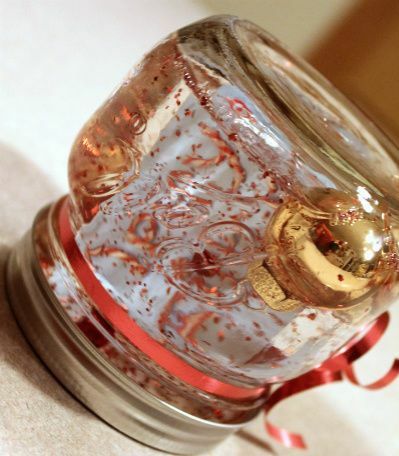 I took a Ball canning jar, filled it with red glitter, miniature ornaments, and some red beads. Next, I glued a Target gift card that says “Merry Christmas” to the lid so it would stand up straight in the jar. Lastly, I filled the jar with water, screwed the lid on, flipped it over…and it became a festive holiday snow globe filled with a gift card! 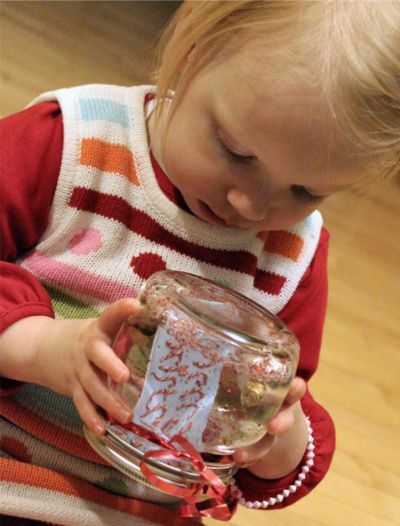 Kate was in awe of our little creation–and her daycare teachers loved them, too! ummm….you put the gift card inside the snow globe filled with water?? It seems kind of weird for the teacher to have to extract her gift card from a jar of water. @”Marie”–The gift card was glued to the lid of the jar, so it comes out as the jar is opened, and pops right off the lid for them to use. It may seem weird to you, but Kate’s teachers all loved the creativity behind it! I love this idea – and was thinking about doing it, but was worried that the GC sitting in water, would ruin the scanning thing (yep…that’s the technical term) on the card and it wouldn’t work. Any thoughts? Also, what type of glue did you use? @G+D. Well they’re not going to tell you it’s weird to your face! And yes, I realize the card is glued to the lid. It’s still a gift card in a jar of water though. I loved this idea! Much better than handing over a simple GC. I pinned it! Such a fun idea! I will keep this in mind for the future, thanks! Oh and, Merry Christmas Marie! Definitely cute! My daycare provider would have probably totally not gotten it though – so we just stuck to a check in a normal card for her Glad Kate’s teachers liked it! @Desiree–In reading through the comments on the blog where this idea was originally found (linked at the top of my post) it sounded like the GC sitting in the water wasn’t as issue. One person mentioned something about keeping it in there for 2 weeks and it still working great. I used a glue gun to glue the card to the lid. It pops right off with a little pressure. @Marie–Good point. Some people do have a hard time being honest to my face. Love yours! I did these too and used red glitter and the same gift card! 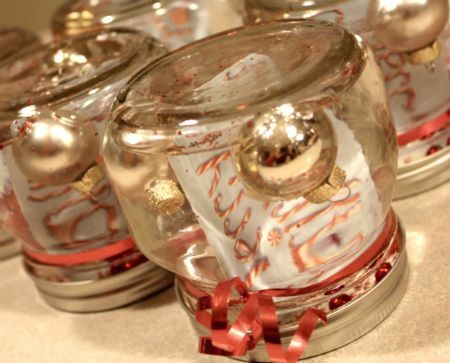 I glued heart candy cane ornaments to the outside of the jar and glued some sequins fringe to the lid. I wish I had taken a picture! You are so clever and cute. I think that’ SUPER thoughtful of you too. We (well, my husband) only gave the staff at the child care center some cookies that we (well, he) baked. I feel like we already give them so much of our dang money, it’s hard for me to want to cough up more….scroogey, I know. I can’t believe it’s Xmas Eve Eve! Yours sound precious, Kent! You’ll have to snap a picture of you do them again next year. @jbhat–Aww, what a great hubby you have. So nice of him to do that! Merry Christmas! What a great idea, I can’t wait to give it a try. It is kind of like the exact opposite of weird in my humble opinion. what a great idea! Ill have to remember this next year for Morgans teachers. @debijo–So happy to hear your kids loved them!